CNC S325 are Computer Numerical Control type of sinker edm machines. It features with 2.5D Mode motion machining. The oil tank capacity is up to 350 liter. The oil tank of this model is designed underneath of the machine body, where allows it to fit into facilities with limited floor space and working areas. 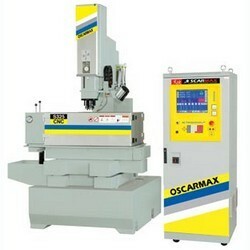 With its latest FUZZY intelligence function, it will automatically come out with he machining parameters. The work table is 650 x 350 mm, suitable for working on small workpiece and mould, such as: electrical components, mobile phones housing and etc.